Where are humanist or non-religious funeral ceremonies held? A humanist or non-religious funeral is a very personal ceremony held to remember the person who has passed away and say a final goodbye. You can hold the ceremony anywhere you like, although most are conducted at cemeteries, crematoriums or outdoor burial sites. Who conducts a humanist or non-religious funeral ceremony? A celebrant, who will work closely with you to create a personal ceremony. During meetings with key family members, a celebrant will find out about the person who has died and the kind of funeral they wished to have. This will enable the celebrant to write a script that is crafted to the individual. Talk to one of our funeral directors who will help you find a qualified celebrant who is available in your area. What happens at a humanist or non-religious funeral ceremony? As a personal alternative to a religious or faith-based ceremony, perhaps the most important part of a humanist ceremony is where the celebrant and/or family members and friends pay tribute to the deceased. This is followed by time for reflection before the committal – where the curtains are closed or the coffin lowered – and final words of thanks as the funeral comes to a close. The ceremony can include music, poetry and readings that have been chosen by family and friends. 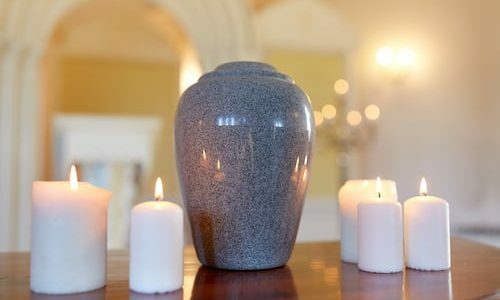 Humanist funerals will generally not include hymns or prayers, or readings referring to religion, but this can be discussed in more detail with the celebrant. You might already have something in mind, or you can ask your celebrant to make suggestions. Do you have to be a humanist to have a non-religious funeral ceremony? No. Your loved one might have described themselves as ‘humanist’, but in fact non-religious funeral ceremonies are for anyone who lived their lives without religion. The deceased might not have believed in God, and could therefore feel that a religious service would be inappropriate. In addition, you might feel that a non-religious ceremony more accurately reflects the outlook of the person. In addition, people of all faiths are welcome at a non-religious funeral ceremony. The emphasis is on celebrating a person’s life, and the celebrant will always ensure that everyone present feels comfortable.